Many of you, may never heard about 'SR 3D Builder' before!? 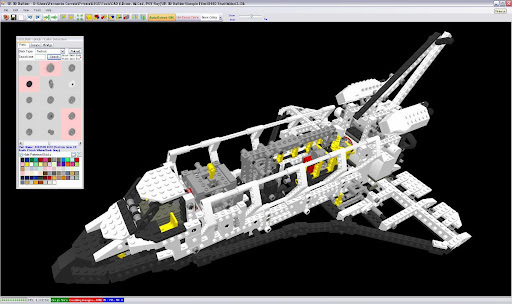 A CAD application for PC, which allows you to create LEGO models. It was created by Sergio Reano, who as been working on its successive enhancements, since 2006. Besides extremely fast on real time rendering, while rotating complex models, 'SR 3D Builder' is not just another LEGO CAD application and it is certainly not because of it, that I'm writing here today about. It was a bit more than one year ago, when I tried a new 'SR 3D Builder' feature which let me totally astonished and which I was not expecting to see any time soon running this smooth, on a desktop PC (and have been since then, promising myself to write here about it...). Unlike other LEGO CAD programs like LDD, MLCAD (LDraw package) or LeoCAD, this program is easily and automatically capable to detect rotation axles in parts like gears or hinges, solve connections between these parts and animate their movements in real time with proper relative speeds! Of course I'm here not comparing this, with professional CAD applications like SolidWorks and others similar. Doubt it? Then take a look in the small sample video below, that I've produced to illustrate the feature. But if you enjoyed it, then you may want to see some other videos that Sergio recently prepared to show the capabilities of his application. Some more examples, may also be seen at Sergio's YouTube channel. Certainly, features like these, would be a great addition to LDD and others, despite different targeted audiences. Once some have shown curiosity to see how does 'SR 3D Builder' animations would perform with large part-count and complex models, I took the hint and produced another video using the 8480 (Space Shuttle) model file. While in some situations the results produced are really promising, some others are more funny, so to say! Don't forget some parts may have not been patched to support automatic rotations and some other sections of the model seem not properly connected for some reason, which originates a few disruptions (probably not properly handled during set model definition, whichever CAD application was used to make it). It happens for instance, with some hinge plates at the delta wing. The model has a complex gearbox with driving rings which require proper setting (positioning), to make the functions to work, but not achievable with simple rotational movements. Thus some preparation required to see every e2e mechanism and respective gears working. Also the moving parts behave like ghosts, moving into the space already occupied by other parts upon rotation movements. To be honest I was also not expecting it to be different at this stage. It is astounding that Sergio is developing this application apparently by himself. The amount of work involved in unbelievable. Not only did he write the application, but for the connections and gears to work he also had to patch all of the individual parts. This is really an application geared (pun intended) toward Technic. Bravo Sergio! A question. All of the animations appear to be video captures of the screen. Does the program have the capability to export a video file? Such a thing would be immensely useful for me in compiling Technicopedia. as I know from the application, it doesn't directly support such feature. For instance my video was captured with a freeware screen capture application (Freez Screen Video Capture) and post processed with WMM, for titles and compression. Captured just part of the screen, but it can also capture the full desktop. There are other free applications available too! By chance I've also asked earlier today to Sergio which application is he using, just for curiosity, but I'm still waiting for the answer. Guess it is something similar, but will let you know once answered. According to Sergio, he uses also a freeware app, for screen recording 'CamStudio 2.0'. By coincidence one that I also found, when looking for such, but ended downloading and installing an other app, as mentioned in the post above. As I did, he also recommends to use some good compression tools, after video capture. Wow... to be honnest, I heard several times about this program and never had patience to start with it. But now, this tools seem amazing! Anyone having issues getting it to run on XP? It runs, but I can't seem to actually build anything (and yes, DirectX is installed per the directions). Maybe you would like to try it yourself with the 8480 example. It worths! Don't forget motors won't work yet in this version, some parts won't also and some seem not properly connected in the model, which originate a few disruptions. Also the model has a complex gearbox with drive ring and so. @conchas: Hm. Almost everything I do ends up with a non-fatal error. Loads up, I pick a brick type, double click on it (which I'm assuming is what I need to do since nothing else does anything) and get a unhandled exception. It's directX related. Have you noticed the remarks about DirectX on the download page? Basically it states you must have the latest MS DirectX drivers available for free from the official MS website. If it doesn't result, I can only suggest to contact Sergio directly via e-mail. He certainly will have interest to fix any further errors still existing. @conchas: Yes, and I also read the part where it states that if it crashes on startup to ensure that you have DirectX installed. It wasn't when I started, which did lead to crashing on startup, it is now, which lets it load. I can't even get it to run. Of course, I'm using Windows 7 64-bit Build 5057, but even it won't even start using compatibility mode (neither Vista or XP compatibility work). And of course, Windows 7 has the latest version of DirectX installed. Interestingly enough, this is the first program that I've had problems with (32-bit or 64-bit) in Windows 7. - Fourth (for Vista users): even if you have DX10 installed with operating system, Microsoft have updated its DX9 library since Vista was released and my application uses part of these updated so it maybe necessary download and install latest version from MS official sites. Note that my application is developed under Vista 32bit so it MUST work !!! Hi, I have windows vista x64 ultimate and ATI graphic. The application crashes at startup. I install directx 10 and latest graphic drivers. Please help. if you read on xSergio comment above, you'll find clearly stated, that this application doesn't work yet on 64bit systems. I have just downloaded and installed the program, and it is great! My dreams are comming into reality. And the rendering... it is so fast. as promised in videos, here it is latest version of my application. Big mistake this time: I have uploaded a [b]WRONG VERSION[/b]. still not tested under Windows7!! I don't know if you knows the news, anyway a new version of the application has just been released. It is tested and works under Windows 7 in both 32bit or 64bit environment.